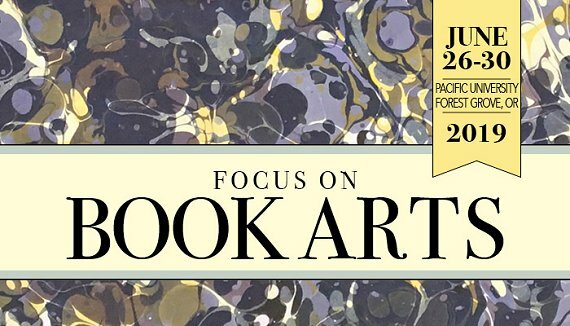 The 14th Focus on Book Arts conference offers five full days of workshops that appeal to beginning as well as advanced book artists. You can come for just one workshop or for the entire conference; a range of class lengths lets you tailor an experience just for you. All of the workshop details and schedule, housing and meal information, as well as other conference activities are available as a PDF here. The Society of Bookbinders 22nd Education and Training Conference will run from the afternoon of Thursday 29th August to the morning of Sunday 1st September 2019 and will be held at the University of Bath. This is an exciting change of venue for us giving a chance for you to visit the ancient Roman City of Bath. This venue is also a new construction with up to-date lecture theatres and accommodation. The conference will be hosting the Suppliers fair, in a new format and more integrated into the conference function. The restaurant and evening venues are alongside the main conference Halls as are the accommodation blocks. All are on the same level and there are 4 lifts within the conference centre for ease of access. There is ample car parking space at the campus. There are 3 ATM machines in close proximity. The Society's Annual General Meeting will take place on the Thursday evening before dinner. The Suppliers Fair will be open on the Friday and Saturday, and is on the 1st floor, large balcony area, which is between the lecture halls with mid-morning and afternoon refreshments served nearby. The major suppliers of bookbinding and related crafts will attend, and there will be ample time for shopping and browsing. There is an option for early arrivals on the Thursday afternoon to visit the Bindery of George Bayntun in Bath or to explore the City with a guide. The 2019 Standards of Excellence Seminar will be hosted in Philadelphia, PA. The seminar will include presentations from Jeff Altepeter, Rebecca Chamlee, Julia Miller and Graham Pattern. Please check back for more information in the coming months! Registration for OPEN • SET is now open! The OPEN • SET competition and exhibition is a triennial event in the United States, featuring finely crafted design bookbindings. Sponsored by the American Academy of Bookbinding, it is designed to encourage both new binders and professionals, and is open to binders around the world. OPEN • SET 2020 offers prizes and acknowledgement in two categories: participants may choose to bind a book of their choice in the Open Category, or bind a book that the competition provides in the Set Category. Entries are limited to one book per category, per binder. The Set Book for the competition is a commissioned work designed and printed by Russell Maret, a highly recognized letterpress printer from New York. For his biography and description of the Set Book, click here. Binders are invited to work expressively inside the book while creating the binding. It is the hope of the organizers that the Set Book - by inviting a more involved response throughout the whole book - will encourage a fire of creativity in the submissions. Binders from all levels and cultures are invited to participate, as OPEN • SET is not limited to citizens of the United States nor to students or affiliates of AAB. All entries will be reviewed by a blind jury of three professional binders. The three members for the jury are Monique Lallier, Mark Esser, and Patricia Owen. To read their biographies, click here. Books selected for the exhibition will travel to four major cities throughout the year 2020. Multiple Highly Commendable recognition prizes of $100 are awarded to bindings that exhibit an extraordinary implementation of a particular feature of the binding such as headbands, onlays, inlays, design, use of unusual materials, unusual structure, tooling, etc. and J Hewit and Sons Ltd. for their generous sponsorship of these awards. J. Hewit & Sons will have a stand at the event(s) marked '*'. If you would like us to bring specific items for you to purchase, please let us know at least 4 weeks in advance of the event.